Shyam Narayan Prasad Lehengas are costing as low as INR 15,000 only!! This Shahpur Jat Lehenga store is one of the best budget lehenga stores in Delhi. Their prices up until last year were very affordable. All in the INR 20k to INR 35k price range for bridal pieces. But something changed, and the designer bumped up his bridal lehenga prices. Come today, the whole website is on upto 70% off, and the lehenga pieces are back to being absolutely worth it for the money. I thought let me break it down for you and share some of my favourite Shyam Narayan Prasad Lehengas for you to see. I highly recommend all you Delhi shoppers to check out the designers lehenga store at Shahpur Jat before purchasing online. In case you do visit the store, do let me know as well, what is the quality and the look of the lehengas. On pictures they look pretty great for the pricing and the work, but reality is reality right? I haven’t personally seen the collection, so just giving a heads up to do some due diligence before making any big purchases. These Shyam Narayan Prasad Lehengas though not bridal, are perfect for smaller wedding functions like mehendi, haldi, or any puja or day functions. They are simple yet elegant looking and the colours are all season. You can even choose to wear these for your sisters main wedding, without having to pay a bomb for your designer lehenga. The quintessential mehendi lehenga colours. Peach and oranges look amazing on all skin types. Whether you are the bride, brides mother or brides/grooms sister, you can choose to wear these simple gota-patti lehengas without burning a hole in your pocket. I particularly like the orange one on the right with the scallop dupatta border. Looks pretty, isn’t it? You can easily re-use the dupatta on any other casual ethnic wear to jazz it up. Pretty paisa-vasool I think. This one is my favourite in this collection. The electric blue is quite out there, and is perfect for that sangeet night or cocktail party. I would totally suggest a grooms sister to wear this for the wedding. If your lehenga budget is a bit on the flexible side, I would recommend you to check out these almost bridal pieces. All of these lehengas are on 50% to 60% off giving it a good value for money buy. Go for pop colours of red, pinks, oranges that look great with even minimal embroideries and detailing. The thing about Shyam Narayan Prasad Lehengas is that you will always find the same designs in stock season after season. Most of these lehengas that you see in this post have also been around a couple of sale seasons. So it might be just stock clearance, but for the price, if you have the need for it. It’s well worth it. Looking at the prices of these lehengas, I do have one concern. Flare of the lehenga. I am not entirely sure if it is a full flare lehenga for the budget of under 30k. However, if you pick anything about INR 50k, those lehengas do have a big flare for sure. How do I know that? Looks amazing isn’t it? From what I gather, this Lehenga might be in the INR 70k range. Maybe a bit higher as well. You can however find almost the same design in the lower end of INR 50k price range on the website. These two lehengas I totally recommend for bridal wear. The scallop borders on the lehenga skirt and dupatta give it that richness and overall, the outfits are quite heavy in look. 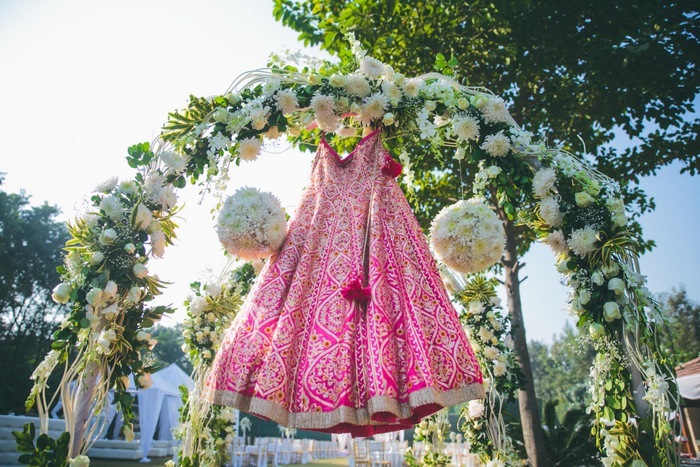 Shahpur Jat lehenga stores typically will not get you any bridal wear under 70k to 1 Lakh price range. So to find anything even remotely working out, these Shyam Narayan Prasad Lehengas are a blessing for budget brides. There are many more bridal lehengas on their website, so do browse through all of them before selecting your favourite. Just one thing I want to point out, their website for some reason is very-very slow. So you got to have your patience while waiting for lehenga pages to open. Other than that, I really hope this post helps some of you shop better for your wedding festivities.